The true cost of food poisoning may be hidden, with research suggesting that long-term effects can include conditions such as irritable bowel syndrome, kidney failure, arthritis and Guillain-Barre syndrome, an auto-immune disorder in which the immune system attacks the peripheral nervous system, leading to muscle weakness and even paralysis. 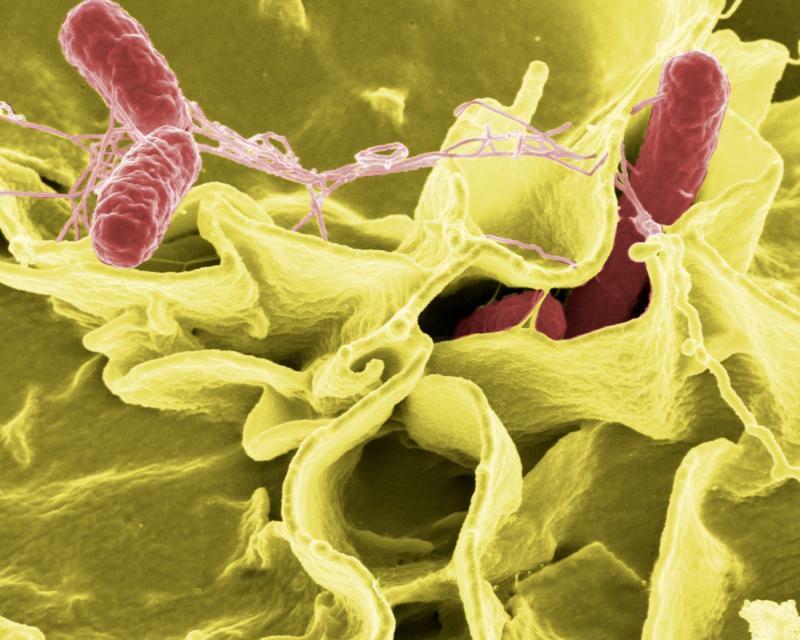 Salmonella up close: the microbe responsible for a rising number of food poisoning cases in Australia. The estimated annual cost of food poisoning in Australia is $1.25 billion. A large majority of these cases of food-borne illness are single, sporadic infections. But these costs do not take into account cases where people don’t turn up at their GP or end up with long term illnesses such as reactive arthritis that may not be readily attributable to food poisoning. Professor Enzo Palombo, of Swinburne University’s Faculty of Science Engineering and Technology, said that people infected with salmonella may have only a mild reaction, but could end up with “reactive arthritis”, which commonly affects the knees and ankles. Other pathogens (for example, campylobacter and some viruses) can also cause this complication. There are many new trends emerging with food-borne disease because bacteria are very adaptable and can be difficult to control, according to Narelle Fegan, a food microbiologist with the CSIRO. “Mostly, the trends relate to seeing the usual pathogens — be they salmonella, campylobacter, pathogenic E coli, listeria etc — in different kinds of foods where we may not have seen them before,” Dr Fegan said. There was an E coli outbreak in Queensland in 2013 that left nearly 40 people affected; another occurred in NSW last year, sourced from food prepared in a kebab outlet, with four people reporting severe diarrhoea. Dr Fegan said that the other challenge with these micro-organisms is that they can pick up new virulence traits from one another or take on antibiotic resistance. Unsafe food also poses major economic risks, especially in a globalised world. Germany’s 2011 E coli outbreak, which stemmed from sprouts grown at one farm, reportedly caused $US1.3 billion in losses for farmers and industries and $US236 million in emergency aid payments to 22 European Union member states. Fifty people died from the outbreak. In the US, the Mexican food chain Chipotle last year suffered multiple outbreaks of food poisoning involving E coli, salmonella and norovirus, affecting hundreds of customers and forcing the temporary closure of all 1200 stores across the country.